Finally, an event for everyone. This top ranking event will immerse you in the extraordinary at Tomb of the Risen Dead every Friday & Saturday from October 5 - 27 from 6:30 - 10:30 pm. 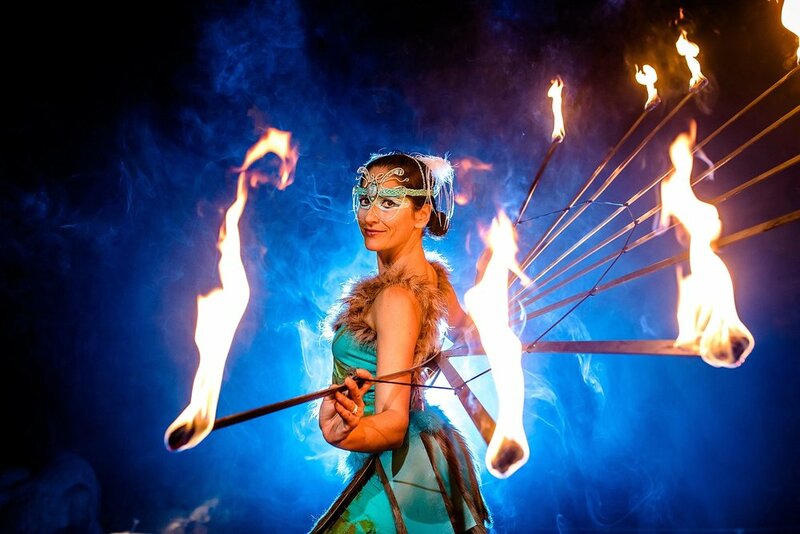 Enjoy our festival area which features new live entertainment each weekend ranging from fire dancing to acrobatics to comedic juggling and more! Experience our three thrilling attractions, fun for all ages, including our newest attraction, the Destiny Express as it's given a spooktacular twist. We also are introducing our Park Fun Attractions this fall for an evening experience with a choice of 6 park attractions specially open for this event. Fall into fun with our family-friendly movies showing under the stars, s'mores for roasting, pumpkin decorating, village entertainment, & more! We hope we have the pleasure of hosting your best memories yet! Live entertainment, food, park attractions and fun for everyone! Bring the whole family for a memorable evening. Rated the top fan-voted Fall event in the Southeast! Choose your fate in an immersive storytelling experience! * Parental guidance is advised due to the spooky nature of our attractions. Enjoy our daily park attractions at night! We will have several of our daiy attractions open for your enjoyment including Blacklight Mini-Golf, Cannon Wars, Traverse Wall Climb, Happy's Hoops, Tubs of Fun, Cave Crawl Box and Panning for Gemstones. Plan your trip to Tomb of the Risen Dead. With different entertainers every weekend, you can have spooky fun all month long. Our park will have two separate sections to ensure that everyone has an enjoyable experience. Our Festival area will have incredible live-entertainment, extraordinary characters and several bonfires for roasting our specialty s'mores in front of family-friendly spooktacular movies. We will have food and plenty of fall festive treats for a memorable evening! Stay tuned with our blog, Facebook, and Instagram for updates on our events. There will be special updates on who the entertainment will be and other exciting opportunities, such as family karaoke battles, child costume contests, and special featured local entertainment. It’s time for our guests to experience a Halloween celebration that they’ve long waited for and that the whole family can experience together! Sign up for our newsletter to be the first to know about everything Tomb of the Risen Dead. 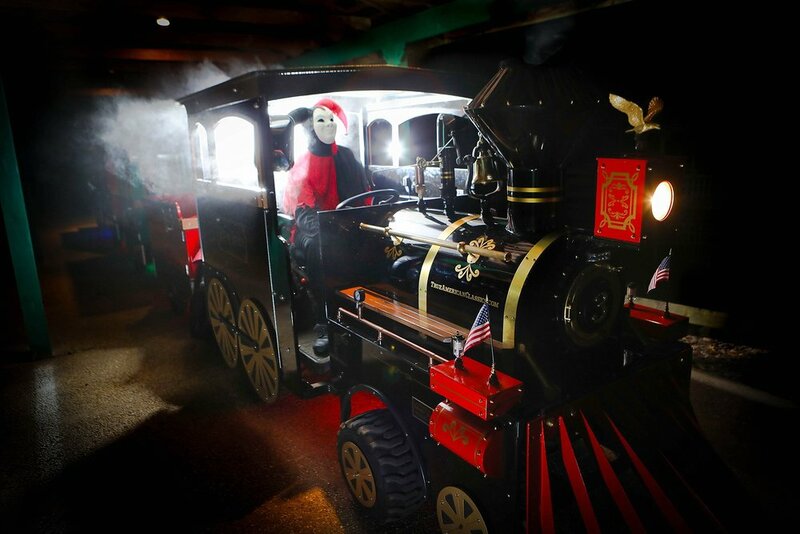 Tomb of the Risen Dead will feature three incredible haunt attractions: The newest train attraction "Destiny Express" will bravely traverse through the night on a mystical journey through the park's shadowy regions. Our other two attractions will include "Jester's Labyrinth" and "Awakening in the Deep." 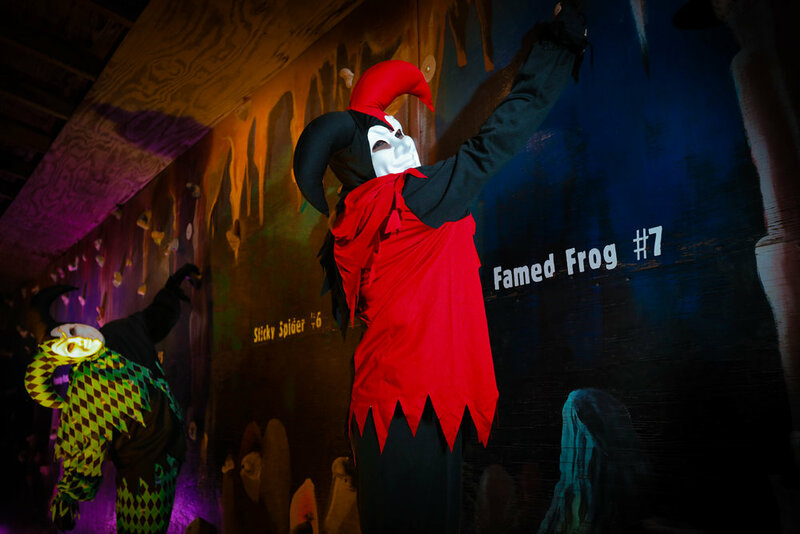 In "Jester's Labyrinth" attraction, each guest will be deciding their own fate and ultimate reward, but not without encounters with the trickiest of the Vardosy Company, Thorn and Mourn. Our cave will be transformed into the "Awakening in the Deep" attraction and guests will experience some thrilling theatrical experiences, and will surely encounter more than just the wise Sage Sisters in the depths of the caverns. When our thrill seekers have experienced each of these attractions, they can join in the festival fun, entertainment and park attractions located in the park. Meet the characters, go behind the scenes, and more on the TORD Fan App. New to Tomb of the Risen Dead will be featured Park Fun Attractions: Blacklight Mini-Golf, Cannon Wars, Traverse Wall Climb, Happy's Hoops, Tubs of Fun, Cave Crawl Box and Panning for Gemstones. These Park Fun Attractions are a not-too-spooky twist on our daily attractions hosted by our friendly Villagers, Characters may occasionally make appearances near these attractions. Wear comfortable walking shoes, so that you are able to navigate the attractions safely. No flip flops or heels. Also, no costumes for those above the age of 12, this is for the safety of our guests and team members in order to ensure that it is always clear who is a Team Member at our park. Our park policy dress code applies to our events as well and can be seen here. Costumes can be worn by children age 12 and under. No costumes are allowed for anyone over the age of 12. If you show up in costume, you will be asked to change and wash off yoru makeup. This is for the safety of both our guests and our Team Members. Yes, tickets will be available for purchase at our gate. What is included in the gate? Our gate fee of $10/adult and $8/child includes our live entertainment of the week, check our schedule for more details, atmospheric host characters, our Jamboree Lip-Sync contest, prophecies for our guests, and a spooktacular movie playing in our outdoor amphitheater by picnic tables in front of campfires. Yes, Our Cave Cafe will have delicious food options as well as specialty Autumn lattes, hot chocolate, s'more packages to roast over fires, an array of tart options, and Halloween-candy inspired fudge along with other treats available. What ages is the event appropriate for? We've designed this event so that there's something for all ages! Our festival area, which are separate from the three spooktacular and park fun attractions, has exciting entertainment, friendly characters, and family-friendly movies that are perfect for younger children! The spooktacular attractions are more spooky and suspenseful than frightening. We recommend that parents accompany smaller children due to the spooky nature. How scary are the spooktacular attractions? The spooktacular attractions are theatrical walk-through encounters where each guest decides their own fate and ultimate reward. 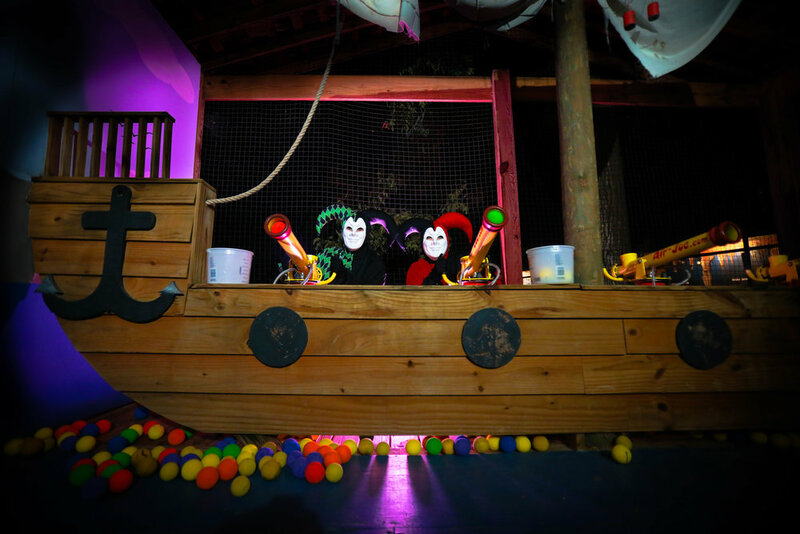 The spooktacular attractions are designed to be more spooky and suspenseful than frightening, although we do recommend parents accompany smaller children due to the spooky nature. There is no blood or gore in any of the attractions. Will the actors touch me in the spooktacular attractions? No the actors will not touch you, and if you touch them you will be escorted out of the park without refund. We put the safety of our guests and team members at the highest priority which is why we have no tolerance for any acts that could harm any individual. Can I take video or photos in the spooktacular attractions? No, you may not take photos or videos while being in our haunt attractions. Flash photography/videography can be painful for our actors and is distracting for other guests. If you take photos or videos during the attractions you may be ejected from the park without refund. Can I take video or photos in the festival area? You are welcome to take photos and videos in our festival area while being mindful of not obstructing other guest's views or hindering or inhibiting our entertainers and our host characters from their performance or interactions. Smoking inside of DeSoto Caverns is strictly prohibited and violating guests may be ejected from the park without refund. DeSoto Caverns Family Fun Park does not allow smoking inside buildings or around attractions. No weapons of any kind including imitation. No costumes for anyone over the age of 12. If you show up in costume you will be asked to change and wash off spooky make up. This is for the safety of both our guests, cast, and Team Members. No shirts with profanity, gang symbols, or weapons. If you come wearing a shirt promoting any of these things, you will be required to change. No photography or videography in the spooktacular attractions. In addition to the DeSoto Caverns Guest Code of Conduct, guests are required to comply with all local, state and federal laws, as well as individual park policies, rules and instructions posted or otherwise listed. DeSoto Cavern's regular Park Policies apply during events at DeSoto Caverns.